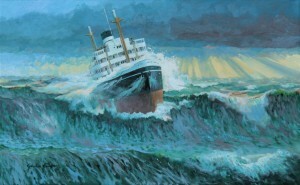 The original marine painting measures 50 x 81 cm (20″ x 32″), oils, commissioned by J Leeson & Son. “The maritime world never believed that we could encounter 27 + waves at sea until they measured one on a North Sea Oil platform. 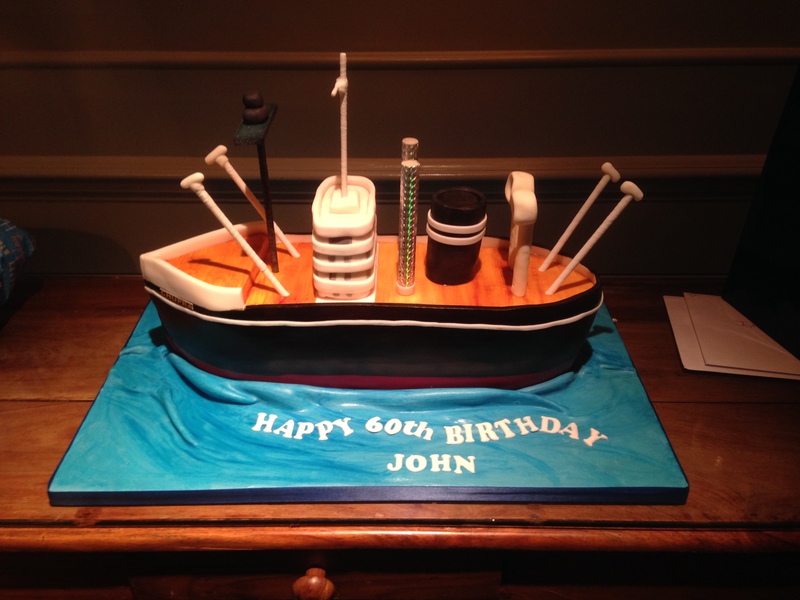 Now it is recognised but I wonder how many ships went down because the Naval architects did not believe the seamen and take such waves into account when designing our vessels” ~ Sir Robin Knox-Johnston. This fine painting is newly available in an exclusive limited edition of 12 copies, museum quality, signed and numbered to represent a fine art investment, a ‘steal’ from £147 including packing and registered post. The print has in it’s margin a remarque showing her last commander, Captain Barney Leeson about who Sir Robin wrote “Barney Leeson, John’s father, was a lovely man, efficient and effective but always helpful to younger officers like myself. I saw him at a BI re-union not long before he died and was glad I did. I would have happily served under him had the occasion arisen”. 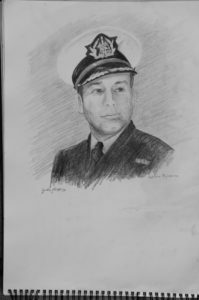 Capt B Leeson; available, a drawing like this costs £270 including registered post. 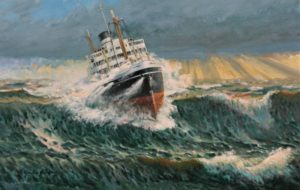 This is the British India Steam Navigation Company Limited ( better known as B I or BISNC) C class merchant cargo liner M. V. Chupra (named after a village in India) encountering encountering heavy seas of the sort found off Cape Town where powerful warm and cold ocean currents collide. 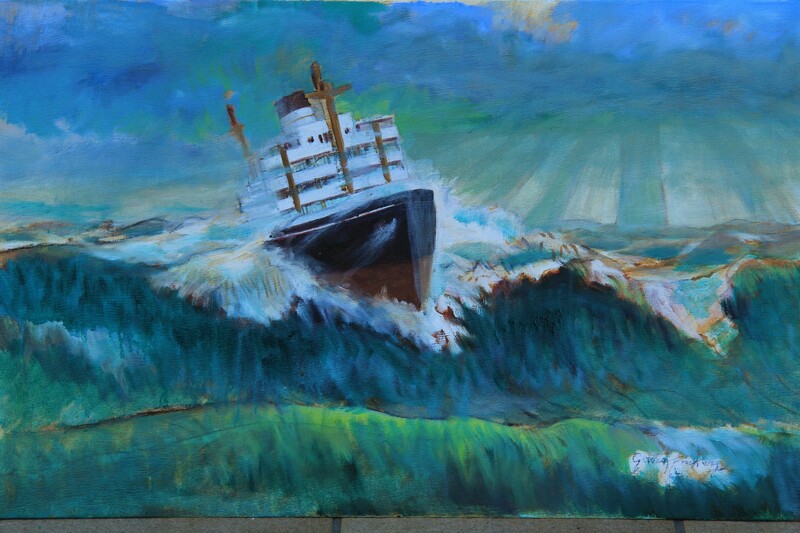 My original thought was a new variant of my painting of the ex Liberty Ship “Trun” including a heavy sea and less threatening sky. This page gives you an impression of the history of a developing painting and background about the Motor Vessel Chupra. 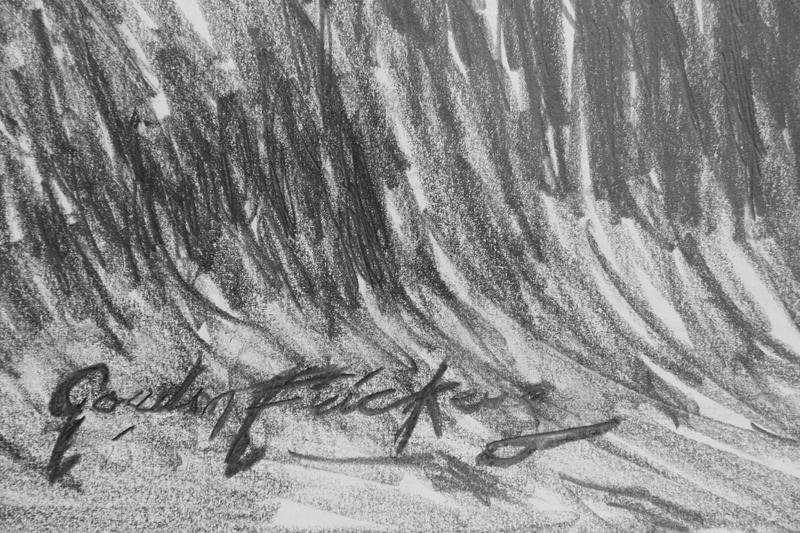 This concept sketch, ‘Decision Time’… one of a series of 11 was chosen as the basis of our new painting. 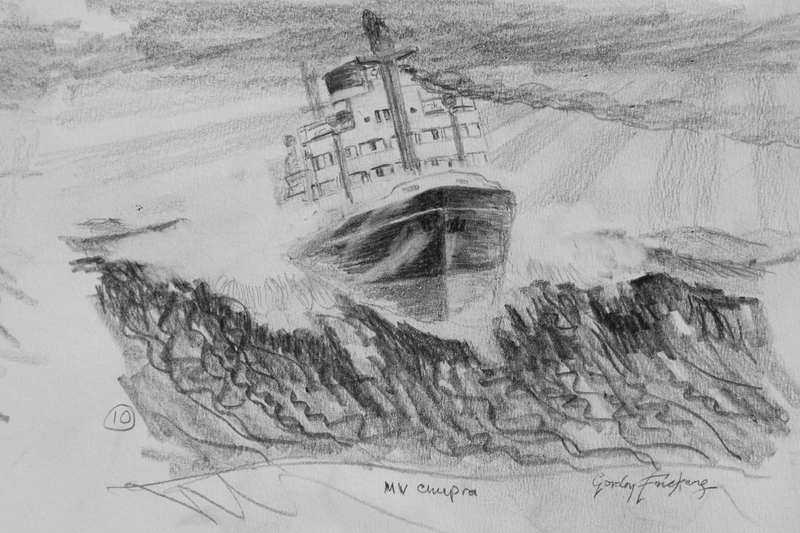 M V Chupra concept sketch 10, available, £130. Graphite drawing, measuring some 13 x 18 cms (5 1/8” x 7”), available, £130 in P & P.
The merchant cargo liner, “Chupra“, encountering 30.48 m (100 foot) waves off the Cape of Good Hope where two powerful currents collide, one cold from the Antarctic the other warm from the Indian ocean. 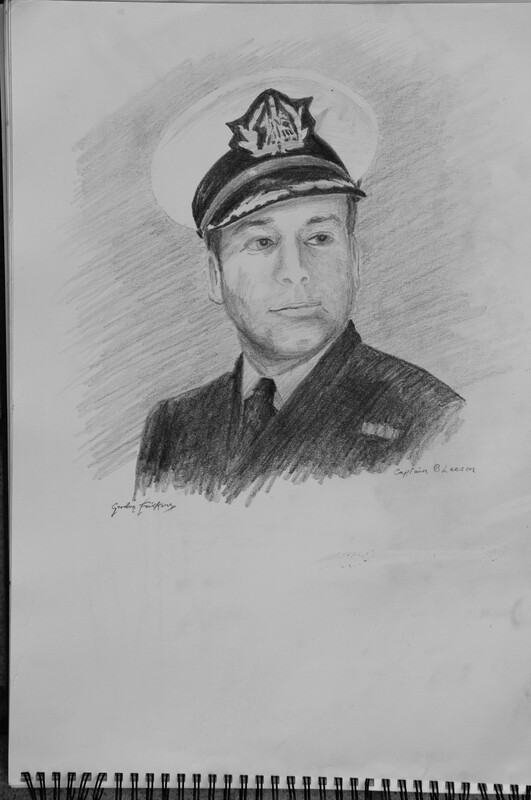 One of a series of 11 studies exploring how we might meet my client’s brief for a painting of his Father’s last command. 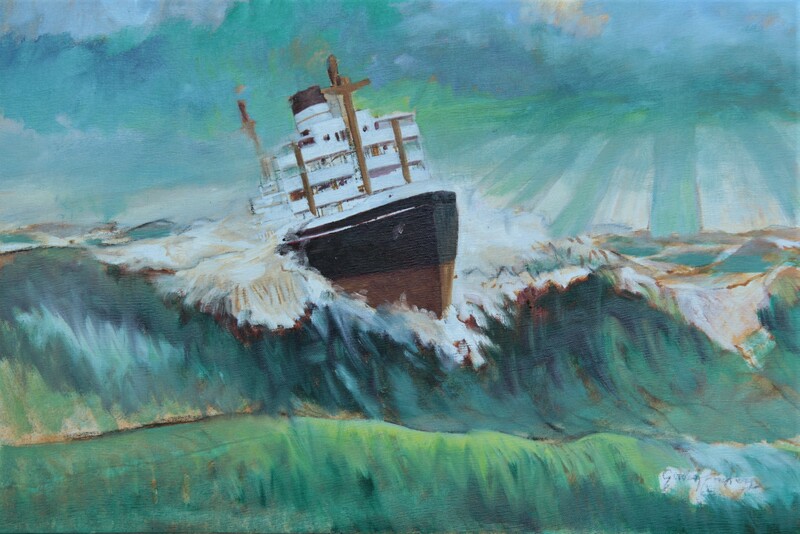 This is the British India Steam Navigation Company Limited ( known as B I or BISNC) merchant cargo liner M. V. Chupra (named after a village in India) encountering encountering heavy seas. That said, like my famous, memorable “Roaring Forties”, painted for Sir Robin Knox-Johnston, available as a signed numbered print (from £147.00), “Chupra” is intended to give us an impression of what sailors can and do face at sea. Conditions most landlubbers find hard to believe but we know happens. 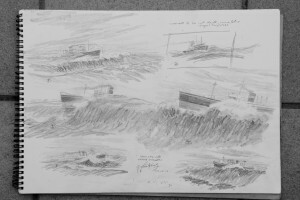 The concept sketches shown here have in discussion with my client J. Leeson & son, lead to a larger drawing, a combination of 1. and 6. 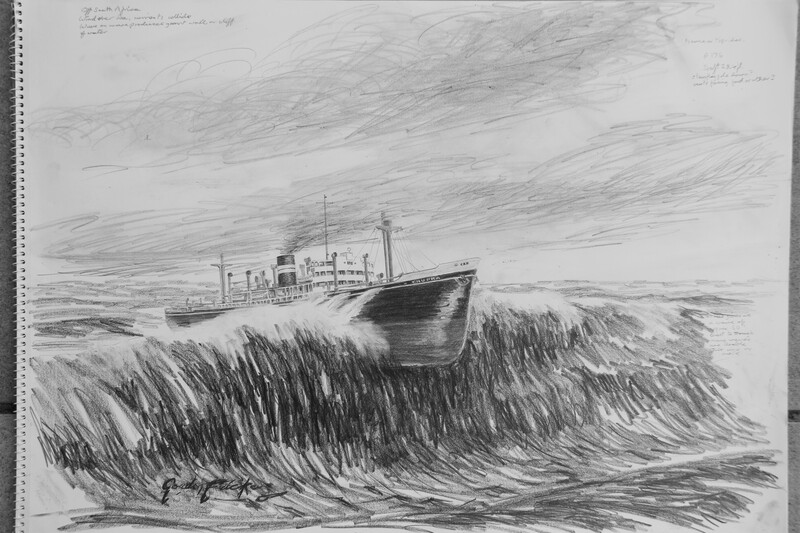 In this case a merchant cargo liner, “Chupra” is shown encountering 30.48 m (100 foot) waves off the cape of Good Hope were two powerful currents collide sometimes creating ‘sea cliffs’, one current cold from the Antarctic the other warm from the Indian ocean. 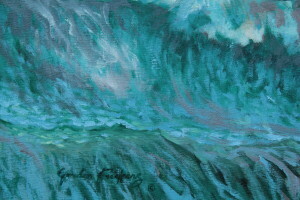 My original thought was a new variant of “Trun” including a heavy sea and less threatening sky. 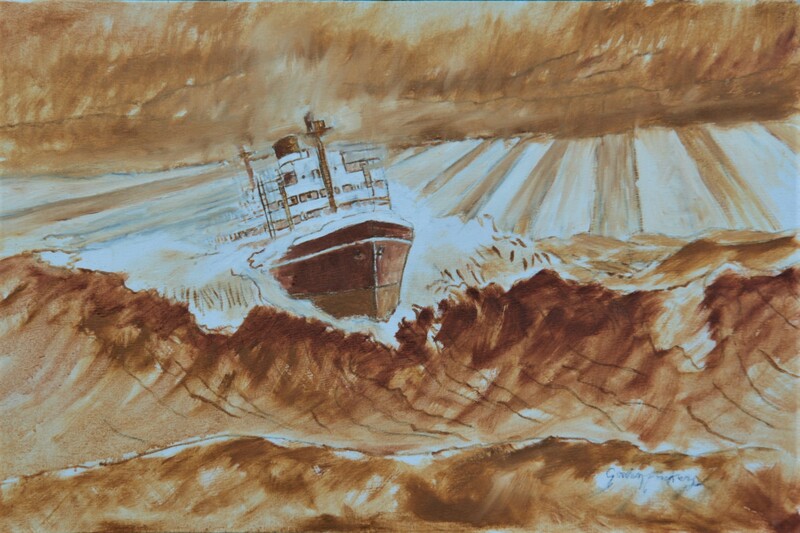 That said, like my famous, memorable “Roaring Forties”, painted for Sir Robin Knox-Johnston, available as a signed numbered print (from £147.00) “Chupra 7” shows something most landlubbers find hard to believe but we know happens. This study, ‘shows wind over sea, where currents collide. The concept took quite a bit of thought to calculate, always a painful process for me. Among other details I have carefully checked measurements of the amount of depth of hull normally below water, exposed by ‘The Wave’. 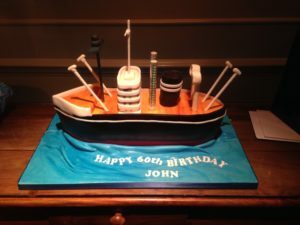 To my eye, at first the exposed hull looked excessive. A careful examination of the scale of the G A of MV Chantala and photographs of other B I ships in ballast and in dry dock confirms my impression. These days, relevant videos can be found on Utube, one on Russian convoys, the heavy weather scenes is appropriate, others include spectacular French films, our French colleagues are rather good at this sort of thing. 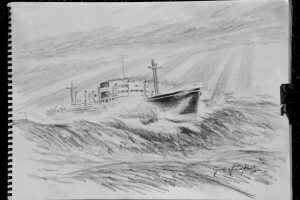 “(7) La Terre en colère – Tempète en mer”. If looking for ideas and inspiration, there are many more videos that landsmen find unbelievable. Graphite drawing, measuring some 42 x 61 cms (16.5” x 23”), available, £150. “Chupra 7”, a proposal by drawing, my client did ask for a dramatic painting ! This is a relatively large and detailed drawing this time, measuring some 42 x 61 cms (16.5” x 23”). 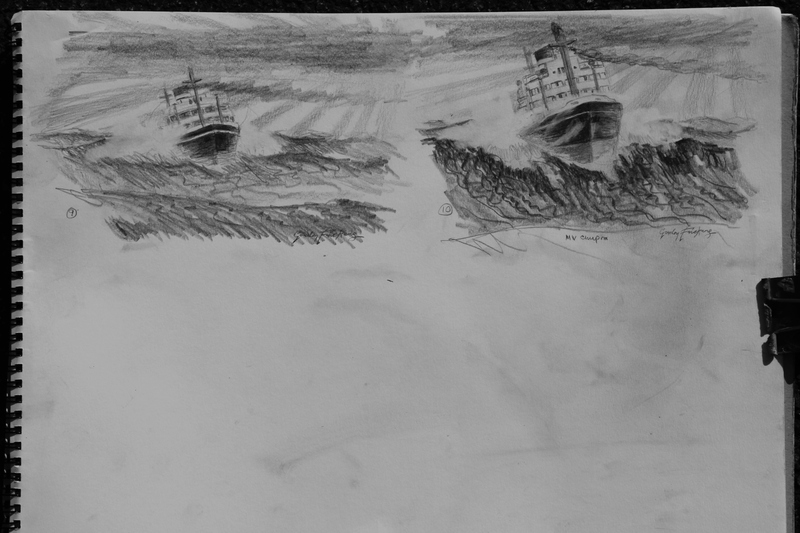 Drawn as requested by my client, J. Leeson and son, a development of concept sketches 1. & 6., as per previous concept sketches. In this case a merchant cargo liner, “Chupra”, encountering 30.48 m (100 foot) waves off the cape of Good Hope were two powerful currents collide, one cold from the Antarctic the other warm from the Indian ocean. 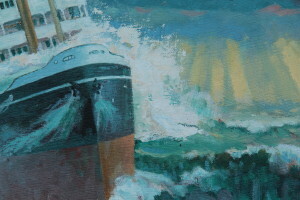 Sea Cliffs, the exist, rig your safety lines, hook on and read on. #Seacliffs, the evidence is incontrovertible. Graphite drawing, measuring some 31 x 40 cms (12” x 16”), available, £150. 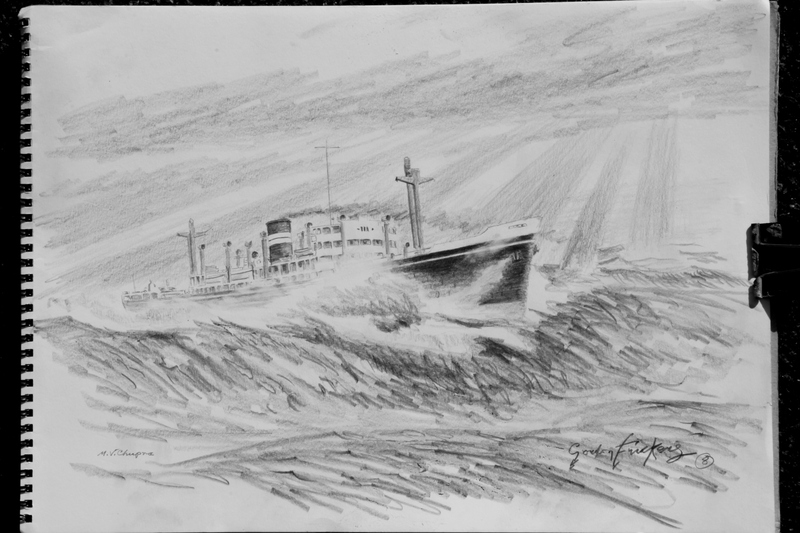 A development of ‘7’, in discussion with my client we decided to try the same sort of study with a less extreme sea, the picture certainly makes a fine drawing of a typical post World War 2 merchantman in a heavy sea, in this case circa 1970. Graphite drawing, measuring some 31 x 40 cms (12” x 16”), available, £150 the pair or £100 each. Exploring different angles, different ways to express the ideas and feelings we wish to convey. A very ambitious, difficult graphite drawing, a solid 8 hours work plus the thought that went into preparing this highly unusual concept, measuring some 31 x 40 cms (12” x 16”), available, £200. 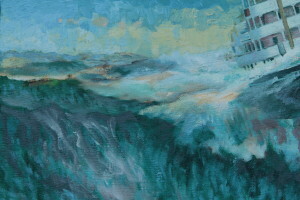 Ariel perspective paintings of ships are unusual, in a big sea more so. This would undoubtedly make a very memorable painting. The only draw back is this study is considerable more work than the original idea discussed and priced with my client. I never try to persuade people to spend more than they are comfortable with. One of the pleasures of my exacting career is sometime clients become friends and in any case we are in a business of making friends. Consequently, although I was willing to ‘go the extra distance’ and did so, this idea ’11’ did not fit the brief on grounds of budget. A pity, it would make an amazing, memorable painting, maybe another client another time, maybe not, chance, the idea hangs here suspended, not taken to it’s dramatic conclusion, a golden opportunity available for another client. 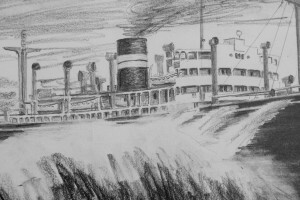 B I Background: ‘M V Chupra’ launched 1944, was one of the very successful B I (British India Steam Navigation Company Limited) ‘C’ class of “fast cargo liners”. At one time the popular much loved B I operated the world’s largest merchant fleet. The company eventually merged with P & O, the last ship to carry B I colours was Uganda. 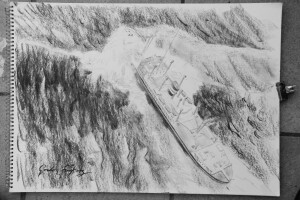 Uganda’s final task was to operate as a hospital ship during the Falklands war. My chart suggests the sky should be lighter as in paler colours including the blue bit top left. For sure the sea will receive more attention and of course Chupra needs to be more ship shape, sharpened up and many small details sorted out. Looking in more detail at the ship a number of issues have surfaced. 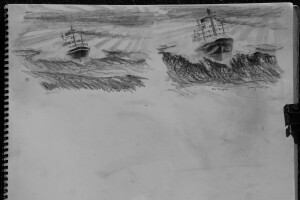 A careful examination of the available photos including in B I by Laxon & Perry, published by The World Ship Society 1994, ISBN o 905617 65 7, page 176, and the GA supplied by my client, confirms as expected, the C Class sisters varied in appearance individually and over the course of their lives. This sets me a slight problem establishing the appearance of Chupra during Barney’s days commanding. I have the final word now, I’m in command mine is the responsibility! The Bridge, in particular the windows vary from ship to ship. 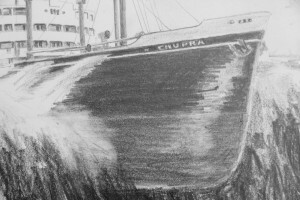 Chupra, in the most modern photo possibly dated 1971, taken in the English Channel that I have still has the 1944 style bridge windows were as some of her sisters have more ‘panoramic ‘bridge windows. Other variations significant in our painting include masts, vents and some of the sisters have a boot topping, Chupra doesn’t in any of the photos I have. I’m worrying about the colours, I’ve yet again pushed limits. However, I’ll alter the sky before worrying to much about the rest of the painting. As Paul Cezanne pointed out, and I am literally of ‘his school’, any change in colour affects the whole painting. The most important ‘variation’ is some photos show a name under the bow, some don’t. My shots of Chupra don’t. However, I’d like to ‘include in’ Chupra’s name on the grounds it helps the uninitiated identify our ship and the name may have been retouched out of the photos to make them more widely attractive to C Class people, a common ploy by photographers back in the 1960’s which was when I attended my first art college & photography classes, (Maidstone 1995). While aware there is still some fine tuning needed to the ship and how she sits in her wave, I’m happy with the general balance of the painting, with the appearance so far of Chuprawhich already includes some nice details like the curved corners of the superstructure and water jetting from unusual places. 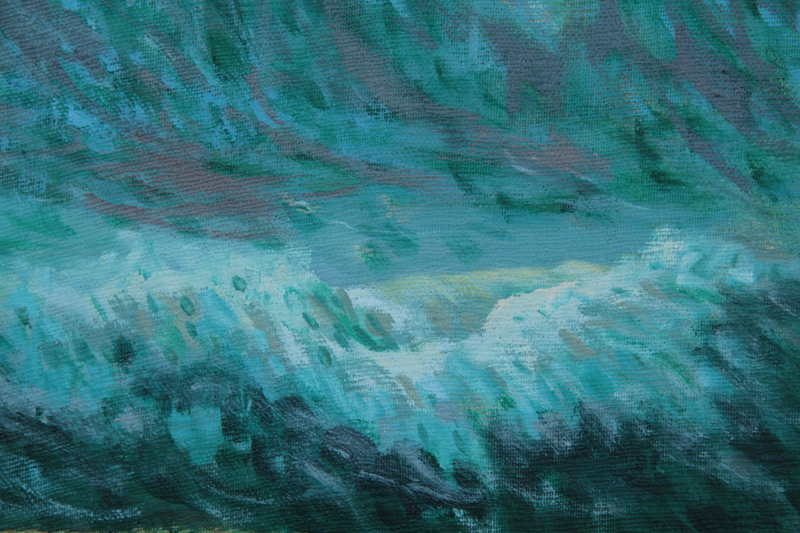 It seems to me to be a busy, engaging painting for such a deceptively simple composition. with slight alterations to concept sketch 10 is as my client has requested, now on the canvas. 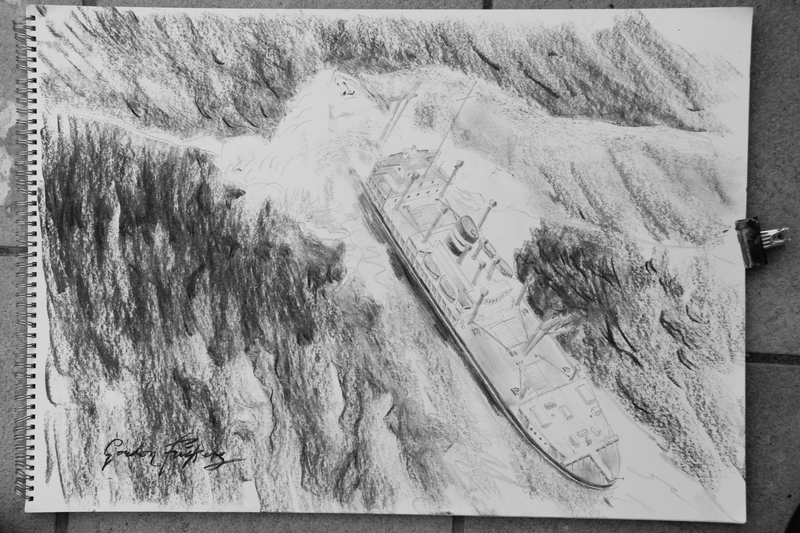 My feeling having given it a few coats of thinking about it, viewing it over a few hours, is the ship should be reduced by about 1/8 so I propose doing that later today or tomorrow on the canvas. 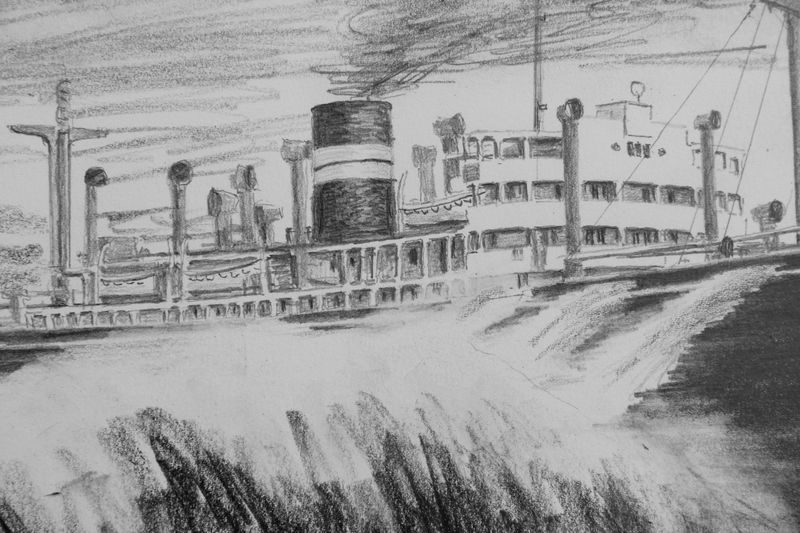 Once that is done, I’ll tidy up the underlying drawing to make this new painting of the British India Steam Navigation Company ship Chupra, look more ‘Chuprish’. That will include moving the stem a little further to the right and more vertical. The stem has already been shifted to compensate for showing as requested, more of the stb side of the ship than is revealed in consept sketch 10; I think it needs to more a few mill further.